ER. Your work covers many disciplines, from sculpture, performance, film and writing. Where did your interest in sound arrive from? AS. Actually I started off with an interest in performance and ideas of removed or mediated agency – the tableau vivant, the puppet, the Ubermarionette, and so on. This led to my interest in ventriloquism and voice projection; sound as a marker of presence. All the work I have done using sound centres very much around this idea of sound and source being pried apart and then joined back together again. I am fascinated by the way sound is at once embodied and disembodied, it marks out a space and denotes presence while it leaves that presence behind. The first sound-related performance I did was ‘Ventriloqua’, when I was pregnant in 2003. A musician played the electromagnetic waves of my belly using a theremin, transforming me into an antenna or medium for the voice. This physical experience of being the receptacle of another body seemed to resonate profoundly with many of my interests, and since then I have worked through various ways of visualising or re-embodying sound. ER. Are there any particular historical periods that influence your work? AS. In my early works I drew inspiration from early Christianity, Byzantium and the Middle Ages, in particular iconoclasm and the articulation of image theory, which centres around the possibility of presence and mediation in icons, sculptures and relics. In recent years I have spent more time looking at the period between 1840-1940, which coincides with the heyday of spiritualism, but also many major technological inventions such as the typewriter, telegraphy, photography, the telephone, the phonograph, radio, film, etc. I am particularly interested in the way the technologies of the time informed cultural understandings of proximity, distance, agency, presence, language and writing. ER. There seems a leaning toward redundant technologies in your practice. What is it about these technologies that lend themselves to your work? AS. Obsolete technologies fascinate me, as do obsolete or surmounted, leftover belief-systems. Redundant technology draws attention to its sculptural and ergonomic qualities, the way it no longer fits our bodies comfortably and has become opaque, heavy, and dense. I am particularly attentive to the way our bodies are implied in these instruments, how we are choreographically and haptically inscribed in the object, which is held, tapped, worn, pressed against our physical selves. Whereas up-to-date technology aims to extend our bodies prosthetically, in a transparent imperceptible manner, obsolete technology becomes more viscous, highlighting the shape of our bodily and perceptual yearnings as well as our boundaries. ER. Although many of your works encounter a sense of ghosting, of inanimate objects being tickled into life, there’s clearly a physical, almost anatomical process at work? AS. Yes, I like to look very closely at the objects I am filming or working with, to transform them into a body of sorts that can be dissected through the gaze, opened up and flayed, animated but at the same time only just alive. There’s something prosthetic and anatomical about the sound technologies I have looked at over the past few years. The musical automata have fascinating inner workings that seem like viscera – the lungs and mechanical fingers of pneumatic tubes, heaving bellows, cranking arms, and mechanically articulated joints. The gramophone needle seems like a fingernail or a tooth, the horn like an ear or mouth. Most technologies are modeled on the body and intended as prosthetic extensions of our anatomical capacities. Equally I am drawn to film certain movement qualities that imply bodily presence or the transmission of presence through objects. There’s a choreographic puppet-like quality that alludes to certain anatomical configurations, a system of transmissible movement. I love the gestures of winding up, turning handles, switching on, pedaling, pressing buttons, in that these hauntings convey a different economy and logic of animation – the folding and contracting of time and gesture into a device that then unfolds, expands and amplifies those gestures. ER. Your latest work Sound Seam certainly involves anatomical reference; I believe you undertook a residency at the UCL Ear Institute? What did that experience bring to the piece? AS. The Wellcome award was fantastic in that it allowed me to spend time at the Ear Institute, speak to people with different areas of expertise, and use some of their facilities such as the microscopes and the anechoic chamber. The staff at the Ear Institute were fantastic, extremely generous and inspiring. I am particularly grateful to Professor David Kemp who provided original recordings of his own otoacoustic emissions, which were to become a crucial element of the soundtrack to the film, layered into the compositions provided by musician Aleks Kolkowski. Professor Kemp actually discovered the phenomena of otoacoustic emissions in 1978 and had a particularly active ear which produced spontaneous otoacoustic emissions (as opposed to evoked otoacoustic emissions). I was also fortunate to work with Professor Andy Forge using the Scanning Electron Microscope – I animated a strip of inner ear stereocilia to make it appear like a groove, a sound inscription of sorts. In addition I filmed the coronal suture of a skull, an eardrum and a gold-plated cochlea. It was fascinating and beautiful. Much of the biomedical content of the film has a poetic resonance with the imagery of the gramophones, phonographs and wax cylinders, and is rather evocative and subtle, so that like the grooves themselves it becomes an abstract moving image, rather than a medical illustration. 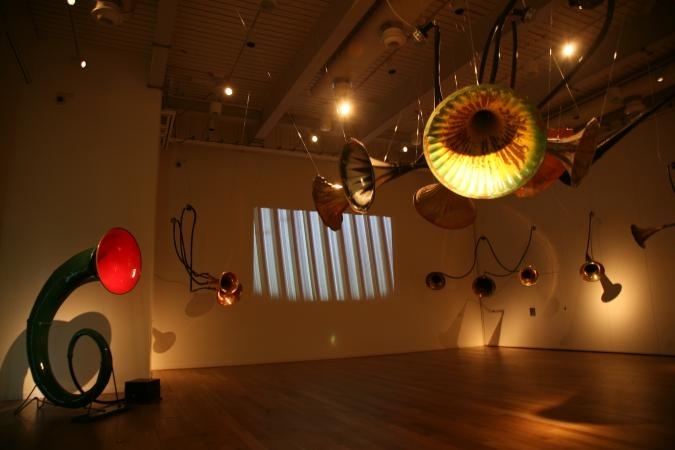 I also worked at the Ear Institute for my multi-channel spiraling sound piece, which reconceptualised a large phonograph horn as a giant ear trumpet tuning into invisible soundwaves, commissioned by the Jerwood Space, and shown there in August 2010. ER. Subjects such as spiritualism, presence even phantom limbs seem vary much akin to the intangible nature of sound. Would you say you are trying to wrestle with the temporality of sound? To almost ground sound and materialise the immaterial? AS. Absolutely. As you say, I have an ongoing attraction to subjects which hover between the material and the immaterial, presence and absence, the animate and the inanimate. Sound is a perfect example of this, in that it both belongs to the body and departs from it, it inhabits a strange inside/outside space, and an intangible subject/object status, all of which I find inexhaustibly complex and stimulating. I am really interested in exploring the embodiment of sound, its materiality, the way it looks and moves. ‘Automamusic’ [watch video] was all about how the mechanical music automata negotiated the visibility of sound reproduction, engaged in an intricate rhetoric of showing and hiding musical performance, transforming readable music notation into codes to be deciphered by a mechanism. Music still looked like itself, though without human performers to animate the musical instruments. With ‘Sound Seam’, I wanted to get into the body of sound, hence the opening sequences of zooming into a variety of horns, as if entering the locus of sound. This is why I spent so much time exploring sound inscriptions, wax cylinder and gramophone grooves using a microscope, as it really enabled a sense of getting under and into the material quality of what is mostly overlooked or merely instrumental to the reproduction of sound. The sound inscriptions are a fascinating material trace of an acoustic event, a kind of pure automatic writing, and yet they are indecipherable to the human eye. I have also yet to finish editing a series of short films on musicians with unusual instruments. The films aim to explore the way the instruments fit, how they imply their bodies, and shift one’s understanding of the space of music. The film I completed on the wonderful thereminist Lydia Kavina is a good example of this [watch video]. The theremin itself as a musical instrument questions where one might locate sound, how it looks, and the haptic engagement with this ether of sound. ER. What have been some of the key influences on your practice? AS. As I mentioned earlier, I am very much influenced by researching and reading about history. I am also drawn to films such as ‘Dogville’ by Lars von Trier, or ‘Heart of Glass’ by Werner Herzog. Those films have an unresolved ethical dimension that I find fascinating, difficult and inspirational, but also a performative mode that is a complicated suspension of disbelief (brechtian alienation technique in the former and trance hypnosis in the latter). I was profoundly influenced by puppet shows as a child, which equally imply a sophisticated mode of spectatorship. I aspire to produce a similar effect on my spectators, lure them in and evoke a sense of bodily or perceptual conviction, which is then subverted or alienated. I have frequently worked with psychoacoustic, optical or sensory illusions as they enable this dual mode of reception – consent, complicity, interiorisation or belief in the experience offered by the work, but equally critical detachment, distance, dissent. Suspending disbelief implies a transitory belief. ER. What do you have coming up in the future? AS. I am currently working on a new film project which looks at Chladni sound patterns and ideas around utopian language, absolute film, abstraction, thought-forms and synaesthesia, exploring also optical-sound-on-film and synthetic music. It’s an ambitious project which has smaller constellation projects which pre-empt it. I am showing the first incarnation of what is provisionally entitled ‘Onomatopoeic Alphabet’ at VIVID (Birmingham) in December 2010, when I will also be showing ‘Sound Seam’ at the Wellcome Collection. Other than that I am working on a smaller film–performances called ‘Drawing forth sound’ for an event as part of the Hayward touring exhibition on John Cage, and I will be doing some performances at Kings Place with a talking book, and at the Barbican, using Chladni sound patterns. ER. 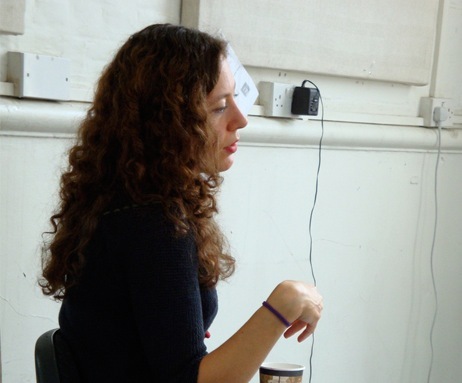 And finally as always, Ear Room asks; what does the term sound art mean to you? AS. That’s a difficult question, as I don’t tend to categorize my practise in this way, nor am I convinced of the usefulness of such categories for artists. I usually make the work that suits my area of interest and enables me to explore my query in the best possible materialisation. Sometimes it happens to be film, other times performance, and on some occasions sound. They all feel very closely related, and the fact that sound features in the work doesn’t necessarily make it sound art, whatever that term means. Reblogged this on JVZ Audio.